On June 14, 2018, Geneva Believer submitted a FOIL request to the City of Geneva for records related to all city contract bids won by Massa Construction since August 2008. A list of all contracts, and the budget amount for each of those contracts, that were awarded by the City of Geneva to Massa Construction from August 2008 to June 2018. 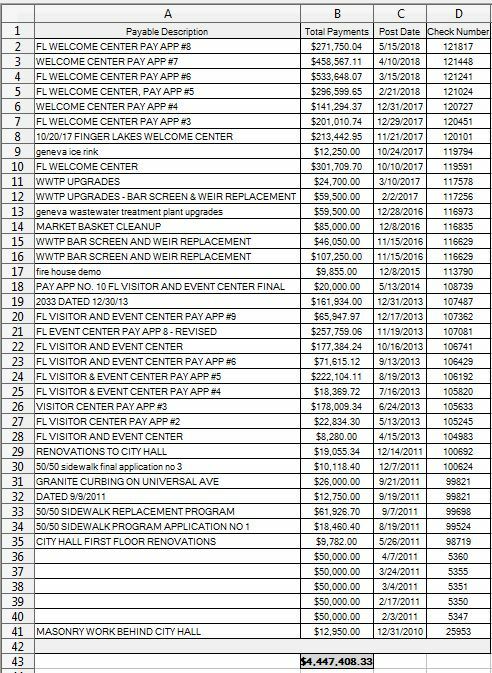 A list of all payments made by the City of Geneva to Massa Construction from August 2008 to June 2018. A list of all the bids submitted, including the names of the bidders and the exact date those bids were received by the city, for all contracts won by Massa Construction between August 2008 and June 2018. Citizens have a reasonable expectation for routine record-keeping to be done for all city contracts. The names of the companies who placed bids on city contracts, the bid amounts for all of those contracts, and the dates all those bids were received by the City of Geneva are fundamental records that should be on file and readily available. The City of Geneva released some documents related to the FOIL request. But a significant amount of key documentation was not released. From August 2008 to June 2018, the City of Geneva awarded Massa Construction nine contracts, and paid Massa Construction a total of $4,447,408.03 for those nine contracts, according to records released by the city. The City of Geneva could not find any records of contracts won by Massa Construction in 2008 or 2009. The city was unable to provide any of the requested information related to this contract except the check number and amount paid to Massa Construction. The City of Geneva paid Massa Construction over one quarter of a million dollars for this contract, but was was unable to provide any of the requested information related to this contract except the check numbers and amounts paid to Massa Construction. The City of Geneva was able to provide some of the requested documentation for this contract. However, the city was unable to provide the dates that the bids were received. Additionally, there were two checks listed with the same check number (99821), with one check for $26,000 and another for $12,750. The City of Geneva paid Massa Construction over one million dollars for this contract, but they could only produce the original contract and amount, the request for payment from Massa, and a list of checks and amounts paid to Massa for the project. The city was unable to find any records related to the bid process. The City of Geneva provided a scanned copy of a sheet of lined yellow paper with two company names and two bid amounts written in pen. 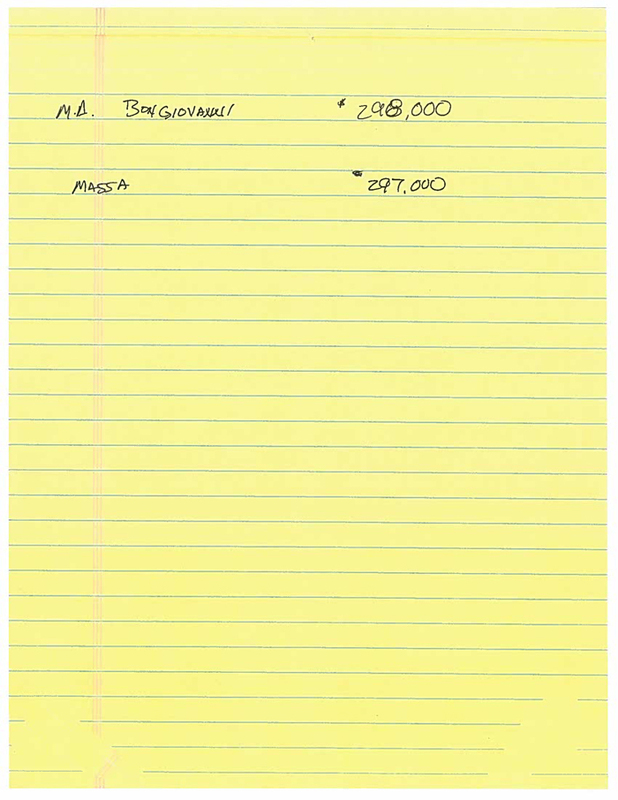 It appears that the bid amount for Massa’s competitor was changed by the author of this document, and the original figure of $296,000 was changed to $298,000. The paper is not signed or dated. It should be noted that the other company that bid on the wastewater treatment plant upgrade was M.A. Bongiovanni Inc., a general contractor from Syracuse NY “specializing in the construction and renovation of Water and Wastewater Treatment Plants and Pump Stations.” Massa apparently outbid M.A. Bongiovanni by just $1,000. The City of Geneva also released the original contract and the check numbers and amounts paid to Massa Construction. The City was unable to provide the dates that the bids were received. The city was unable to provide any of the requested information related to this contract except for the check number and amount paid to Massa. The city was unable to provide any of the requested information related to this contract except for the check number and amount paid to Massa, and a letter from Massa Construction. The Market Basket Brownfield site’s cleanup was overseen by the New York State Department of Environmental Conservation. According to the DEC, the primary contaminants at the site included petroleum hydrocarbons, chlorinated solvent compounds, chlorobenzenes and heavy metals, and remediation of the site was completed for commercial use. The city was unable to provide any of the requested information related to this work except for the check numbers and amounts paid to Massa. The City of Geneva did not produce any records of the bid process for seven out of nine contracts that Massa Construction won from August 2008 to June 2018. Those seven contracts totaled $4,021,152.83 in payments to Massa, yet the City of Geneva is unable to produce any documentation of the names of the competing bidders and the amounts of the winning and losing bids for those contracts. The City of Geneva did release records with the names of all bidders and bid amounts for two out of nine contracts that were awarded to Massa. One of the “records” that the city released featured two company names and dollar amounts hand-scrawled in pen on a sheet of yellow lined paper, with one of the dollar amounts clearly altered by the unidentified author of the document. The City of Geneva was unable to find any records showing the exact dates that any of the bids for the nine contracts were received. The Geneva City Manager from 2010 through 2017 when those nine contracts were awarded to Massa Construction was Matt Horn. The City of Geneva has failed to keep these key records related to over $4 million in city contracts over the past ten years. Considering that the relationship between the City and Massa have been under scrutiny, the fact that so many records connected to Massa’s contracts are missing should be a real concern for every city taxpayer. Contact City Council and tell them to investigate why these records cannot be found. Contact the Office of the New York State Comptroller and let them know that you are concerned with the inexcusably shoddy record-keeping by the City of Geneva, and invite them to pay a visit to Geneva and find out why the key records for over $4 million in city contracts are missing. And remember, there’s no reason to contact the Finger Lakes Times because we know that the local “newspaper of record” has a real soft spot for Massa, even if that means openly and aggressively discrediting and gaslighting their readers in order to discourage any genuine exploration of the unseemly relationship between the city and Massa. And unlike the Finger Lakes Times, which often serves as little more than City Hall’s official stenographer, you can always count on Geneva Believer to bring you the truth about conflicts of interest within our city government. Geneva Believer is beholden to the people, not to the powerful.